Jim’s Gardening services Darwin an offer a same-day gardening services – just call your local Darwin Jim’s on 131 546 or you can book a gardening quote online at at time that works best for you. We can provide a written, no-obligation quote up front, so you know what your costs for gardening services in Darwin will be in advance, before any work commences. We usually will need to view the garden before we can provide an accurate estimate of price. This will give us a chance to assess the size and current state of the garden, and discuss with you what you need, offer our advice and suggestions, and provide you with a gardening service price to meet your budget and needs. Whether you need on-going garden maintenance, a one-off garden clean up, seasonal tree and shrub pruning, fertilizing and mulching, through to lawn mowing and weeding, Jim’s Gardening Services Darwin can help. Perhaps you have a larger garden project in mind – be it installation of automated watering solutions or a water-wise garden design – our experienced team are here to help you achieve the garden you want. 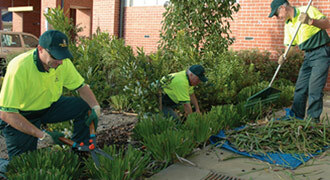 Our fully trained Darwin team can advise on all elements of garden care. Ask them about seasonal soil ph level testing and soil composition, to plant selection, placement, fertilising and mulching, which lawns work best where and why, how to promote strong root systems in different plants, how to avoid damaging plants and flowers when fertilizing, to which wetting agents and watering systems to install. Your Jim’s Gardening team know these things, and have a team of 1500 gardening franchisees to call on if they need a second opinion, or some extra assistance to get the job done, so your garden is always in good hands. Get your weekends back, and call Jim’s Darwin gardening team on 131 546 now or Book a Jim’s Gardening Quote online, today. Adrian was friendly and prompt with the work, however the lawn was left too long. I'm used to cutting the lawn low so it doesn't have to be done often. I would get Adrian to do gardening work again, but would request the lawn to be cut shorter.